OpenDrive continues to provide a more user-friendly interface within its Web-based services, OpenDrive rolled out a variety of new feature enhancements, updates, and easy functionality to its award-winning online service platform for the past months. Palo Alto, California, September, 2012 – OpenDrive is a powerful, cloud based drive accessible from anywhere. OpenDrive is a service offering you 5 GB of free of charge cloud storage to store, backup, and share or collaborate on your files online. Access your data from anywhere from any connection. Upload new files or manage your existing ones, manage folders, create and edit documents with our online office suite all without installing any kind of software. For several months, we have been receiving good reviews and feedbacks from our clients and end-user as we have released several software updates which made their use of OpenDrive more convenient. Branding (White labeling): Business users can customize the OpenDrive website or drive applications. They can replace the logo, use their own domain to access online storage as well as files or rename drive name. Drag and drop: Website interface and desktop applications supporting drag and drop upload from your computer or moving files and folders by dragging and dropping into new location. Statistics and an audit trail on file and user activity: With our activity log update OpenDrive can gives you 90 days of complete reports on file and user activity. You can select logs by account user or by login, downloads, upload and more. Logs are available for preview or download in CSV. Furthermore, Daily, Weekly, Monthly or Yearly report puts you in control of your uploads, downloads and bandwidth usage. Report can shows usage by account user. IP Management: Users can specify IP or range of IPs which can access and download their files. 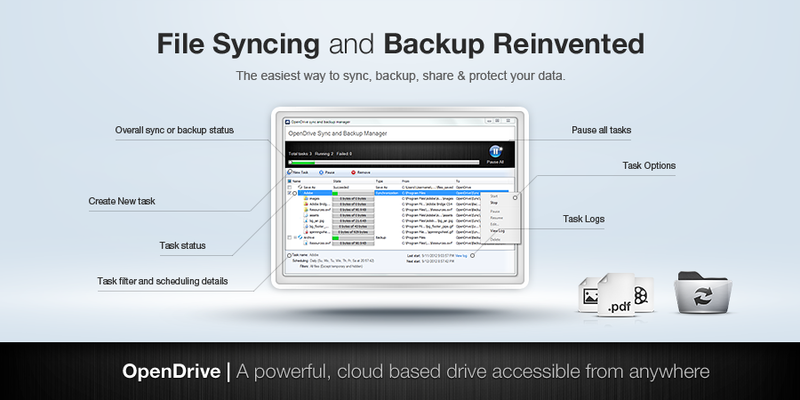 New Sync and backup for Windows application: New reinvented synchronization and backup provides task scheduling to incrementally sync or backup files at specific cycles. Another useful feature added in new update is file filtering, which enables you to specify exact file types you wish to sync or backup. OpenDrive, a Palo Alto, California Corporation, provides a data online service that helps individuals and businesses store, edit and collaborate on files in a secured environment and in a professional way. This interface has the cloud based technology that offers multiple platform applications and creates easy to use desktop application. Since 2008, OpenDrive has already proven its high quality service that provides simple solution for syncing and sharing their digital media. With its over two million users and over 20,000 business all over the world, OpenDrive received numerous and prestigious awards that include TopTenReviews Silver Award in 2011, 2012 and ranked as the top in the 2011 TopTenReviews Excellence Award. It has also received the Brothersoft Editor’s Choice and Soft82’s Five Star Award as well as earning an A review from Good Housekeeping Magazine.